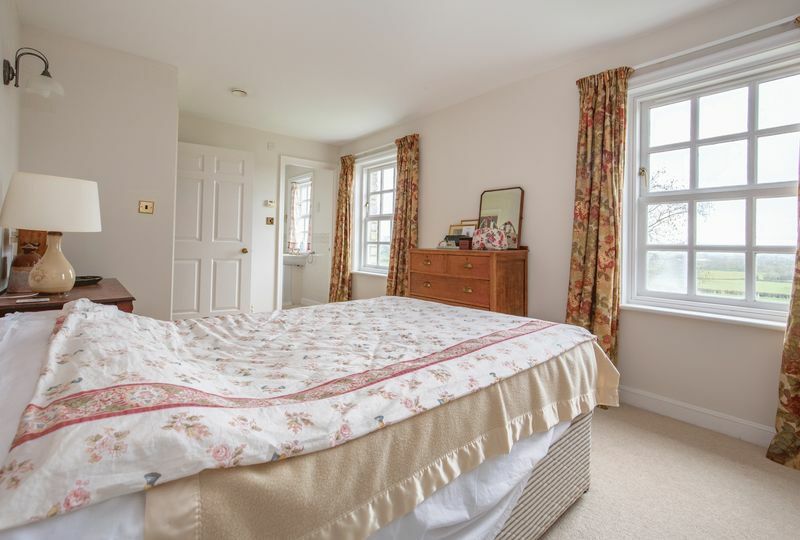 A large light filled house that would fool anyone into thinking this is a period property, in fact, this attractive property is only 25 years old. 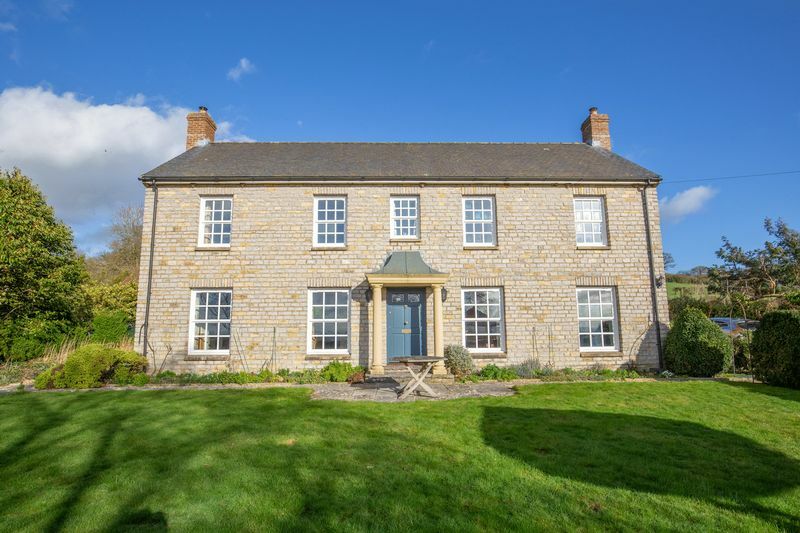 It is a “Potton” build house, so has the style of a period property having been built with local stone, a slate roof and the chimneys are built using handmade bricks, with the advantages of a much more recent build. 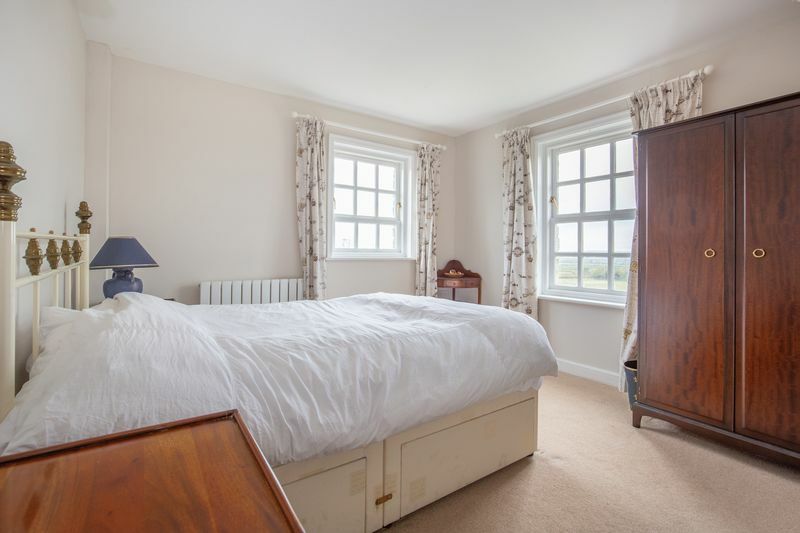 The rooms are particularly spacious with lots of large windows, which are particularly important as the views are fabulous, looking straight over open countryside to the front and rear as well as towards Glastonbury Tor. 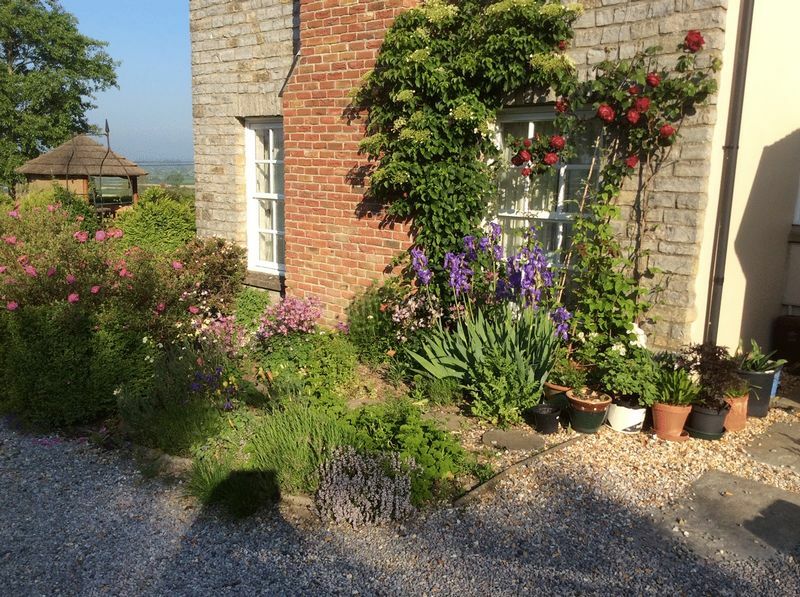 Venture House is tucked away at the end of a quiet lane on the edge of the very popular village of West Pennard. 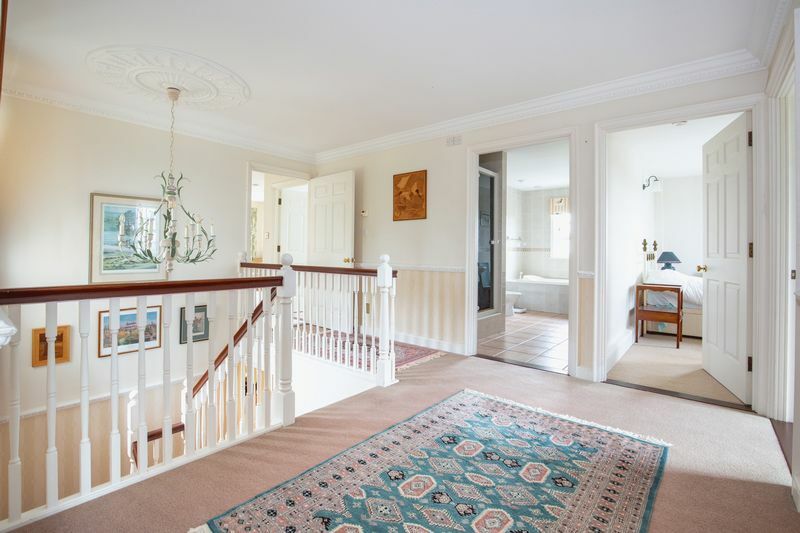 First impressions on entering is the feeling of space and light as the house has a very generous sized hallway with double doors to both the the large sitting room and the dining room. 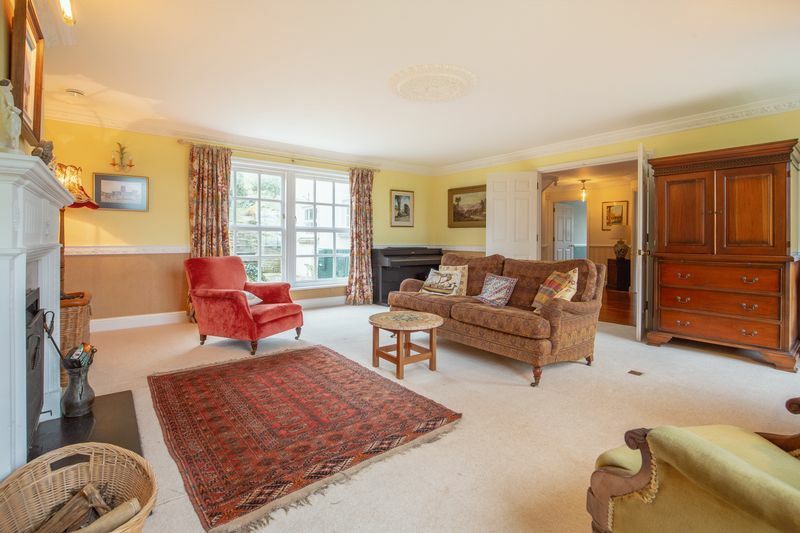 The impressive sitting room has plenty of windows both to the front and the rear gardens while the dining room also has great views over the garden to the front. 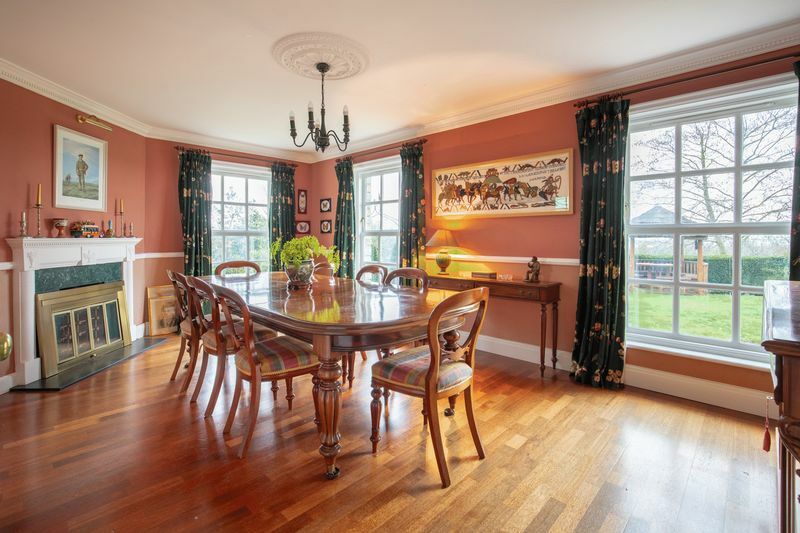 There is also a study which could be joined with the dining room to create a fabulous kitchen/ breakfast room to maximise the views or it could be used as a snug. 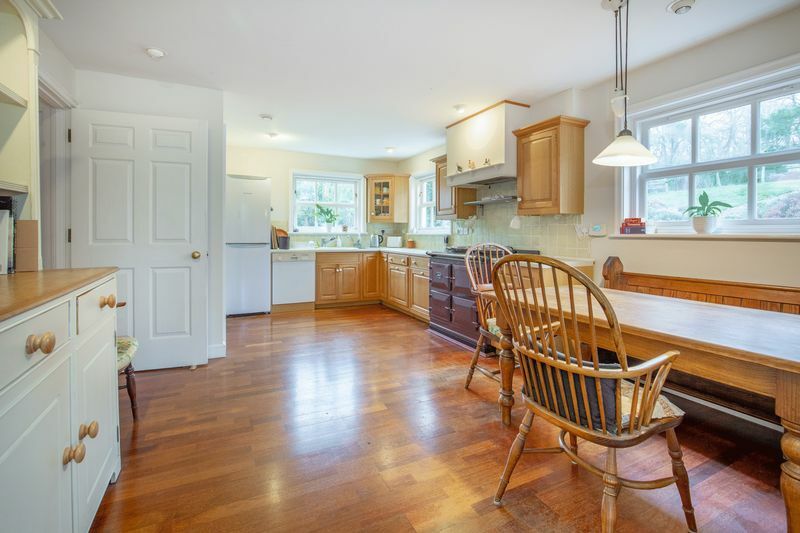 The large family kitchen is at the rear of the property looking over the very attractive garden. 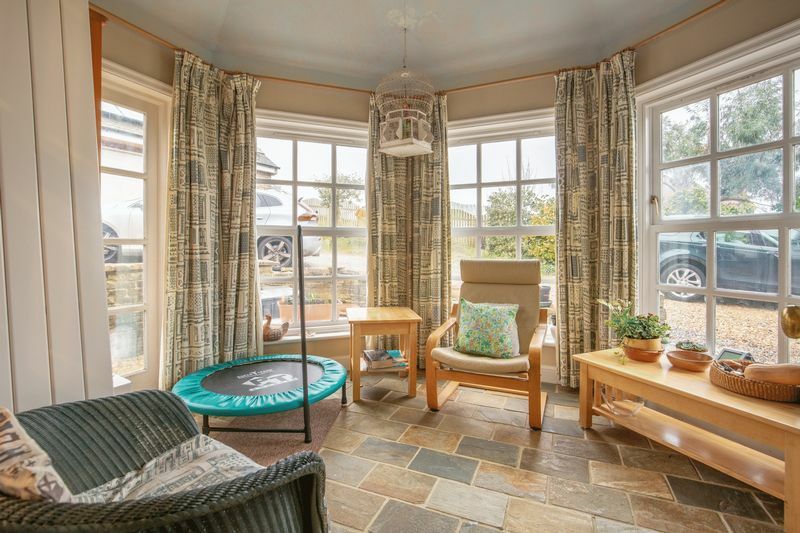 The main features of the kitchen are the aubergine electric Aga, large pantry cupboard and doors that open into the conservatory/morning room making this feel a very spacious environment. 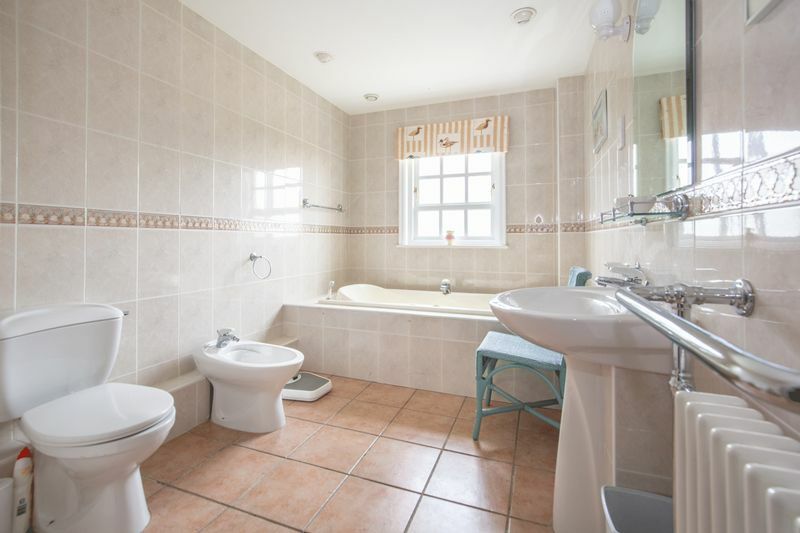 In addition there is also a useful utility room and downstairs cloakroom. 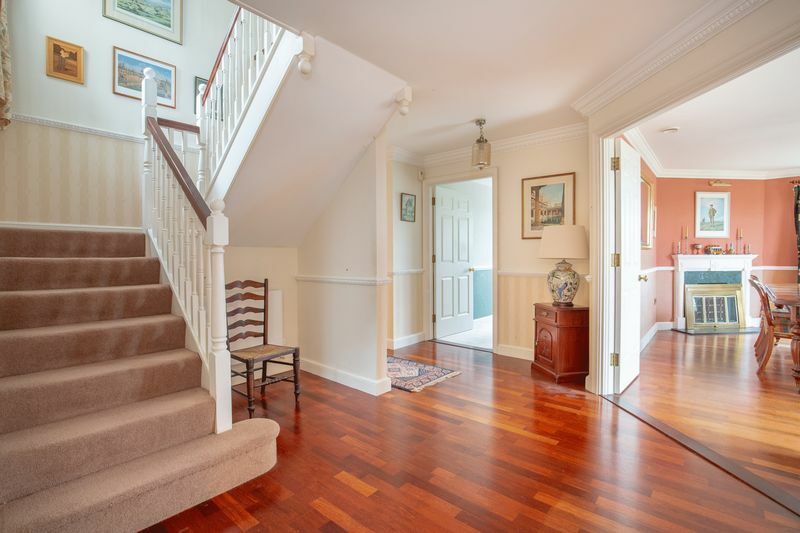 The attractive stairway leads to a generous landing area large enough for a sofa. 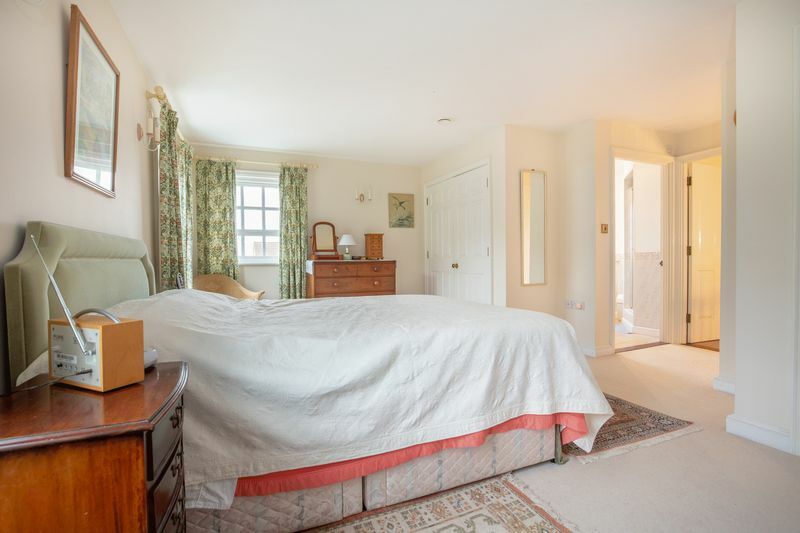 The master bedroom is at the rear, with excellent wardrobes and ensuite shower room plus a large airing/linen cupboard with hot water tank and the internal workings of the integrated vacuum system. 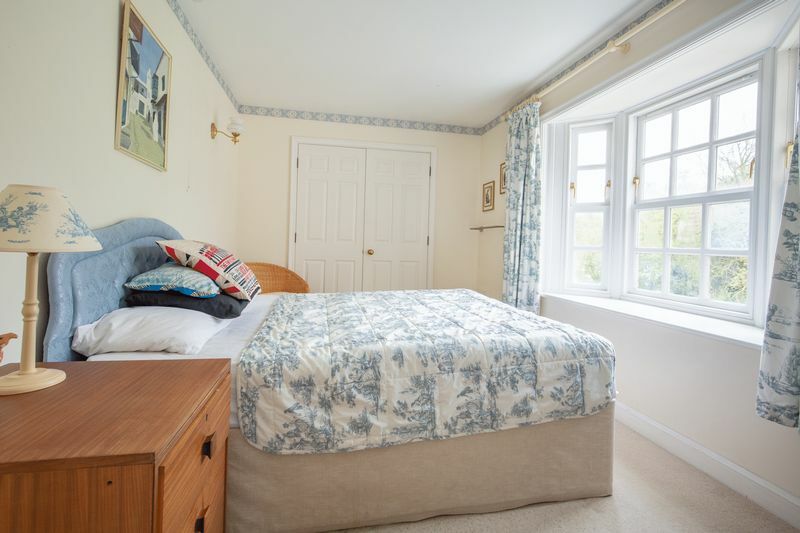 There is another double bedroom at the front with an ensuite bathroom, plus two further double bedrooms and a single, as well as, a good sized family bathroom. 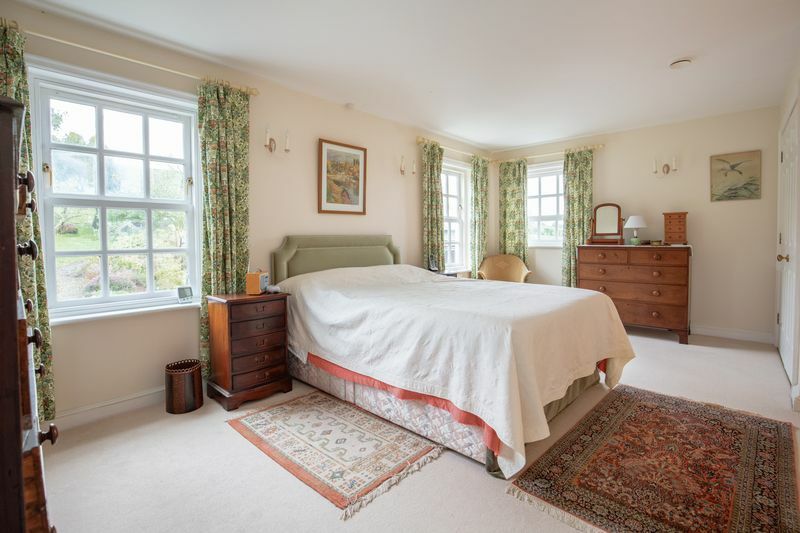 In the boarded loft is a heat exchanger that recycles the air within the house ensuring you always have a feeling of "fresh air". 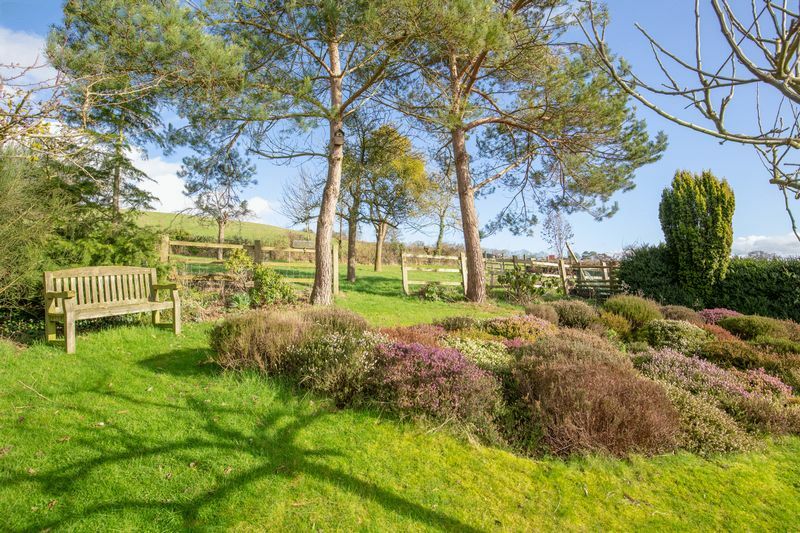 The pretty gardens are laid to lawn with plenty of flower beds both to the front and slopes up the hill at the rear. 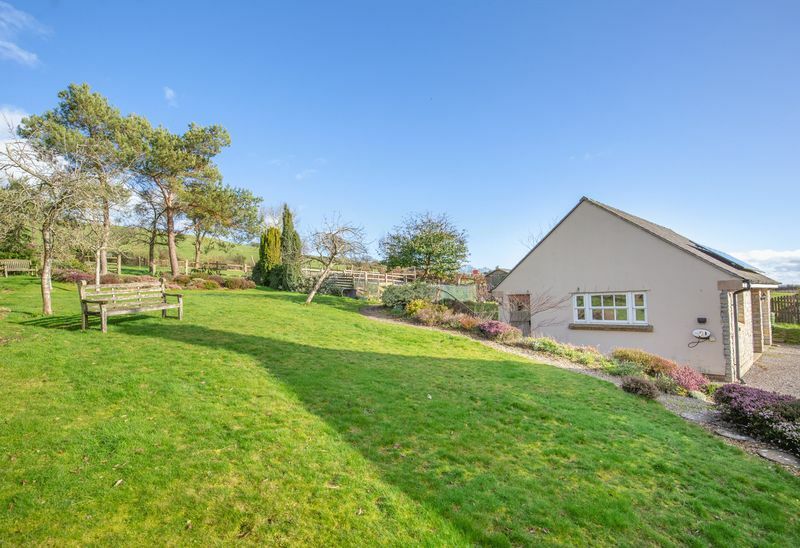 At the top of the garden there is an orchard with a generous area running down the side giving access to the lane, that could be suitable for a pony, alternatively it could be used for chickens, or levelled to create a ball game area. 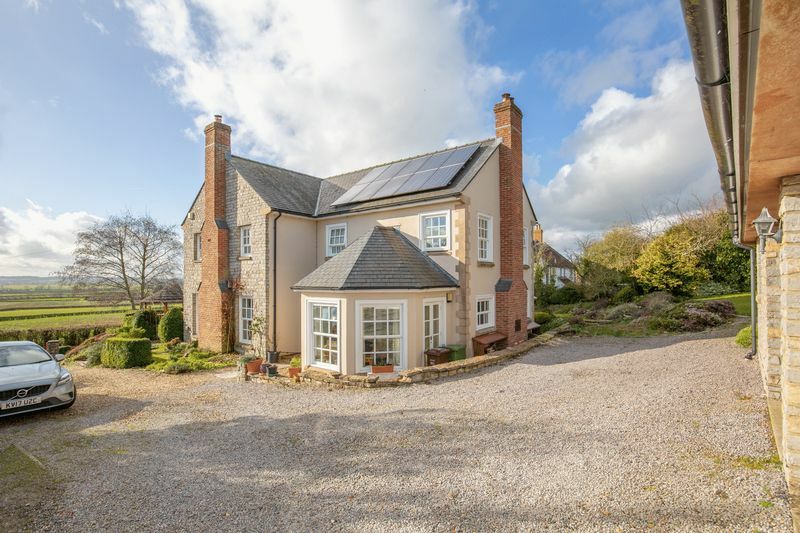 There is a large double garage built in the same construction as the house, making it easy to convert to both above and to the side (subject to planning permission) with an internal staircase giving access to an insulated loft room with two Velux windows, the workings to the integrated vacuum cleaner for the house are also located in the garage. 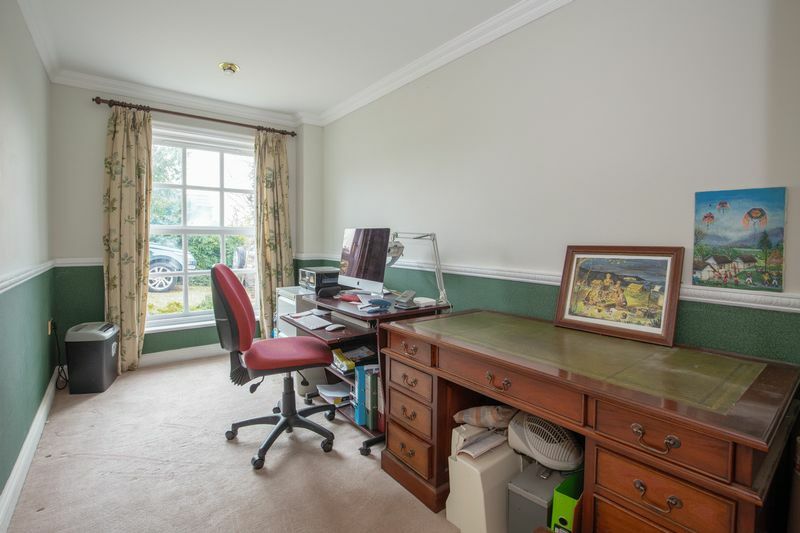 Attached to the garage is a good sized office with separate access and downstairs loo, an electric charging point for a car can be found on the side of the annexe. The driveway has parking for several cars. 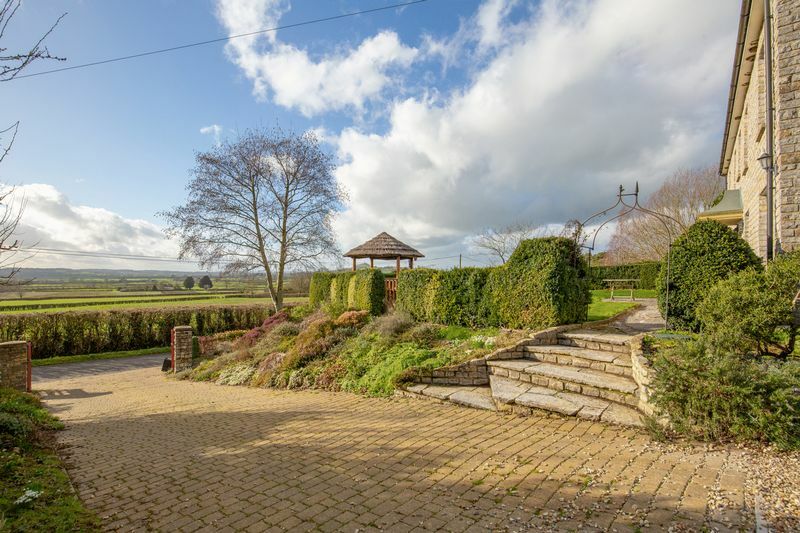 Venture House sits in a large plot in a pretty idyllically quiet lane is set in one of the most sought after villages in Somerset. 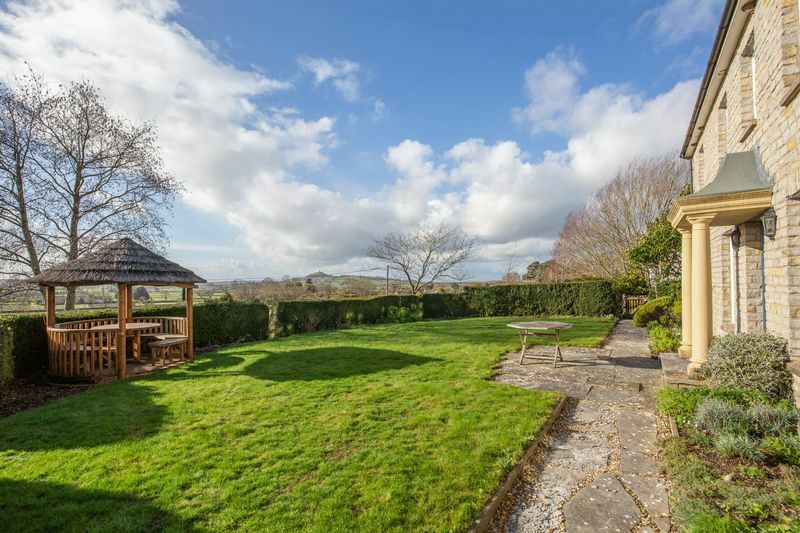 West Pennard is surrounded by beautiful countryside near Glastonbury and Wells. 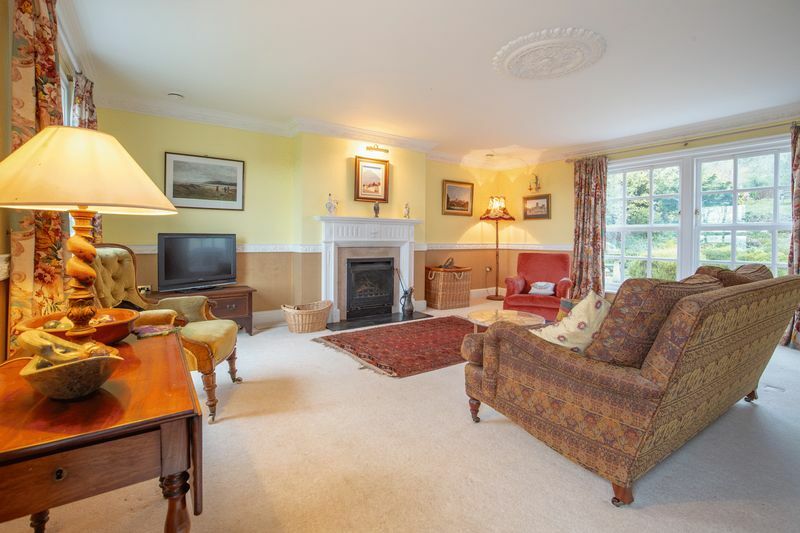 It is an active village with an excellent primary school, a village hall and popular pub. 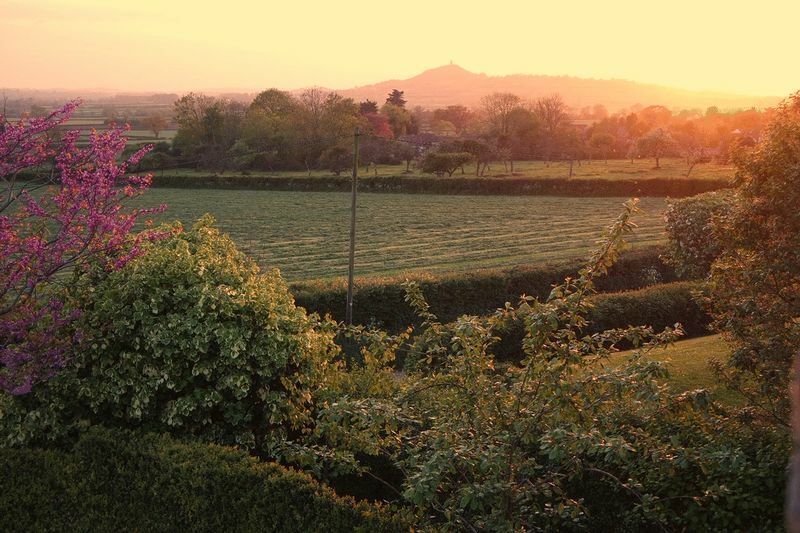 Nearby Glastonbury is a town that is steeped in history going back to the legends of King Arthur. There was a Celtic monastery here in 500AD, which over the next 1000 years evolved into one of England’s wealthiest and influential Abbeys. 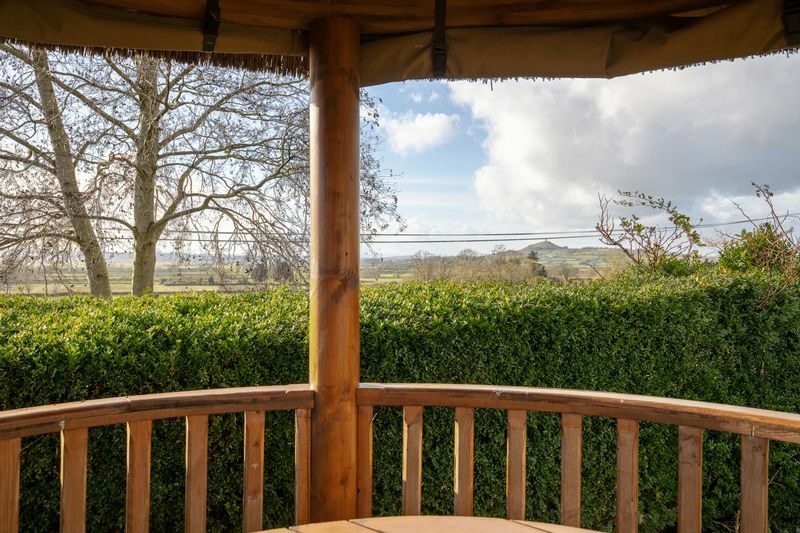 The magnificent Glastonbury Abbey ruins and Glastonbury’s famous Tor attract many tourists, ensuring that it remains a thriving town well served by markets and a huge range of festivities. 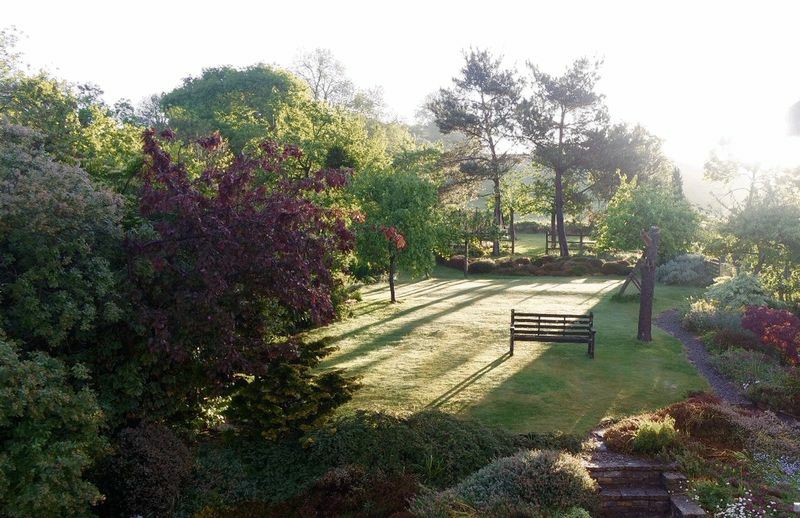 The town is unusual in that it has managed to shun many of the main chain stores whilst still providing all the necessary shops, restaurants, cafes, doctors, pharmacies, dentists, a wealth of clubs and sporting facilities and supermarkets. 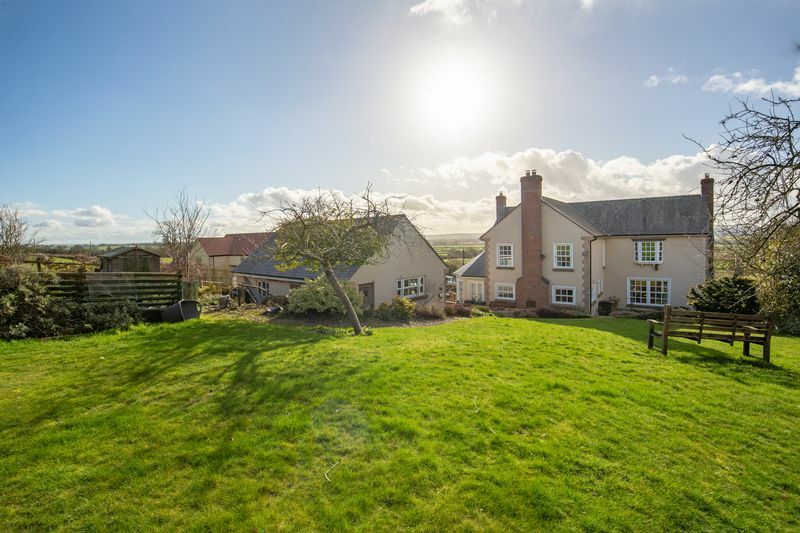 Just 5 miles from West Pennard is Wells, which is the smallest city in England (population 10,000). It's centre is the Market Place (local markets twice a week) surrounded by many medieval buildings including the Cathedral and moated Bishops Palace. Local supermarkets include Waitrose and Tesco. 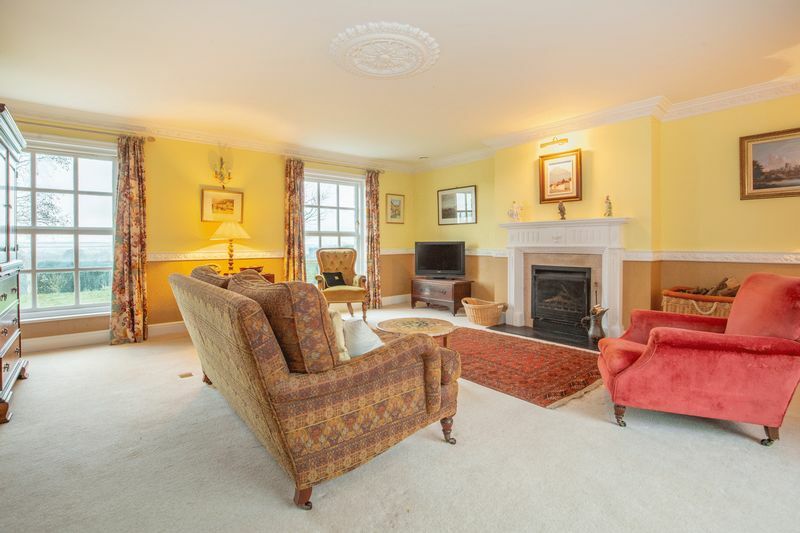 The larger towns of Bath, Bristol and Yeovil are all within easy commuting distance. 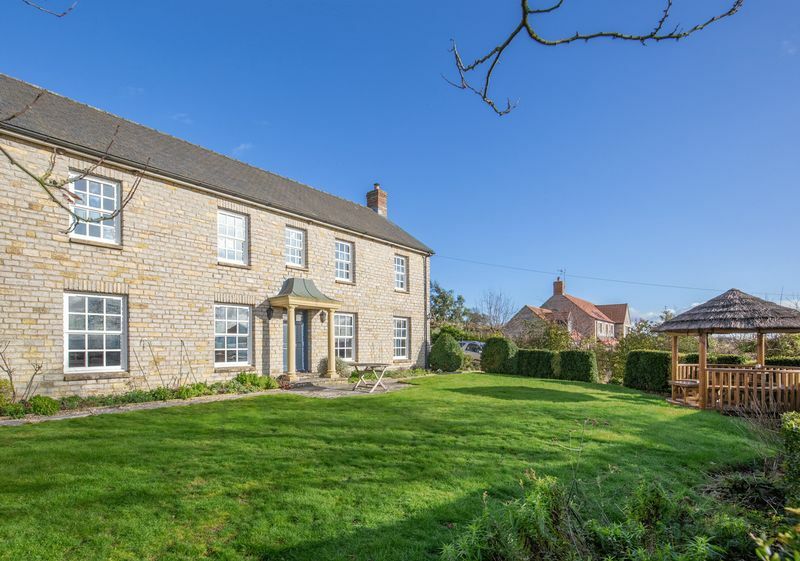 The train station at Castle Cary is less than 10 miles away and has direct links to London. 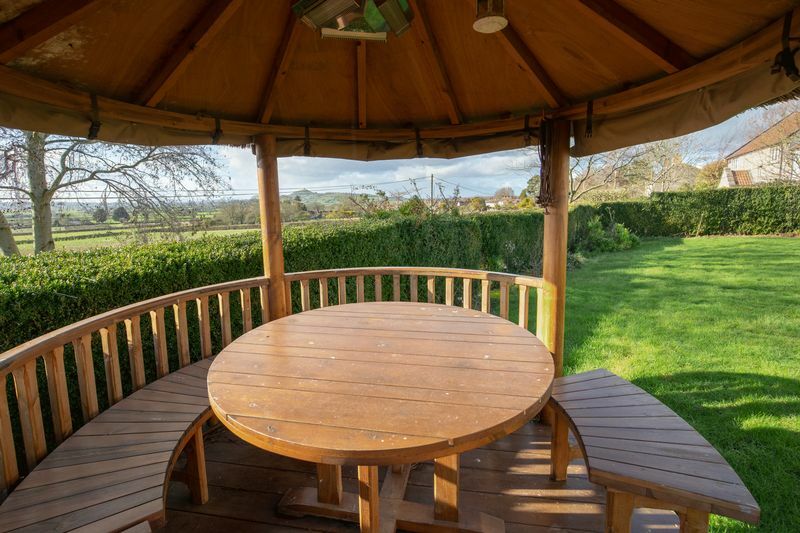 There are excellent local schools including West Pennard’s Primary School and the highly regarded Strode College Sixth Form College. 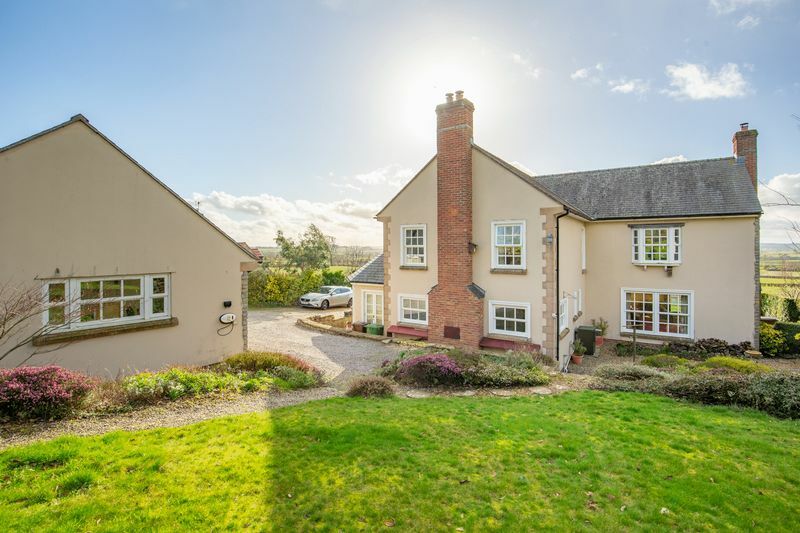 Independent schools include Millfield (prep school is only 5 minutes away), Wells Cathedral School, Downside, All Hallows and the Bruton schools. 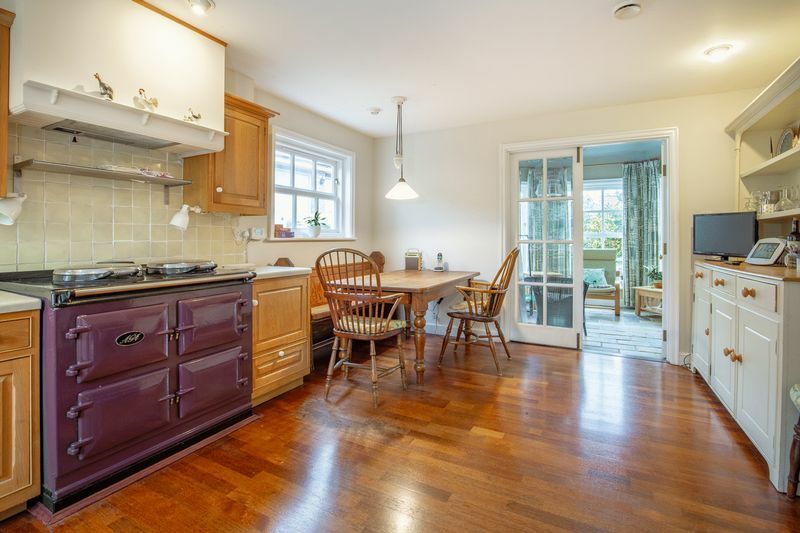 Mains electricity, water, drainage and oil central heating. 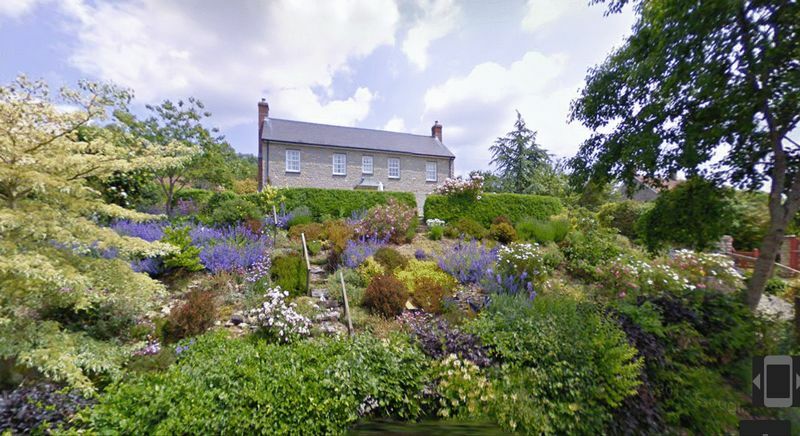 IMAGE OF FABULOUS VIEWING COMING SOON, IN MEAN TIME YOU CAN SEE IT ON A GOOGLE MAP! 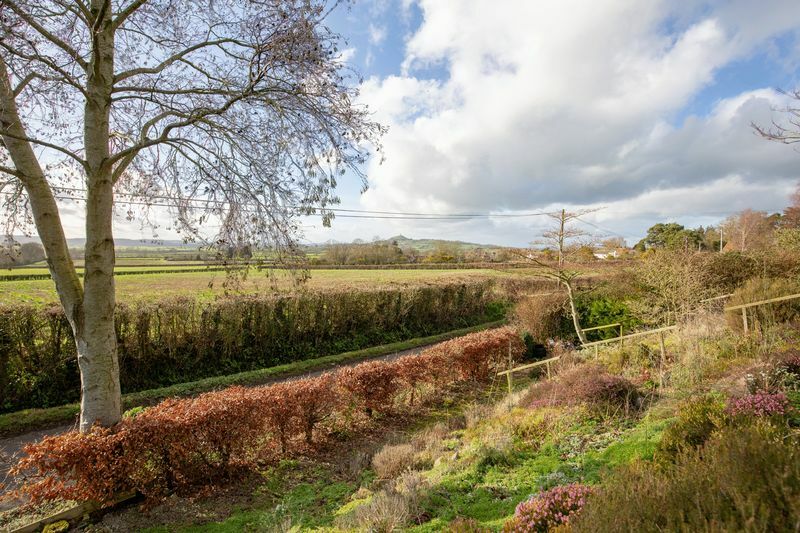 Follow signs on A361 to West Pennard and if coming from the Glastonbury side, turn right into Newtown Lane. Continue past the monument, take the next left hand fork and follow the road around. 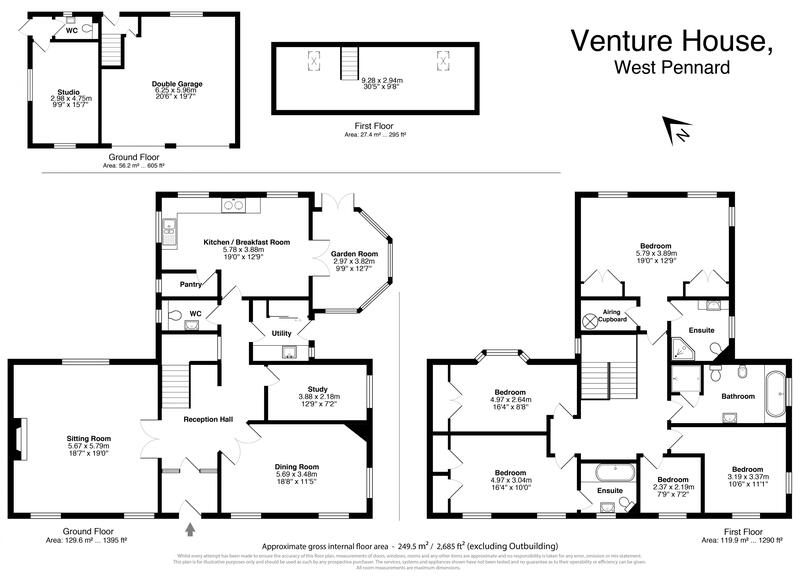 Venture House can be found on the left hand side.